North east corner of Queen Street West and Claremont Street. The West Queen West Heritage Conservation District (HCD) Study was prioritized by City Council in March 2015. The purpose of the HCD Study was to provide an overall understanding of the area’s history and heritage character and to determine if an HCD would be an appropriate heritage planning tool for the area. 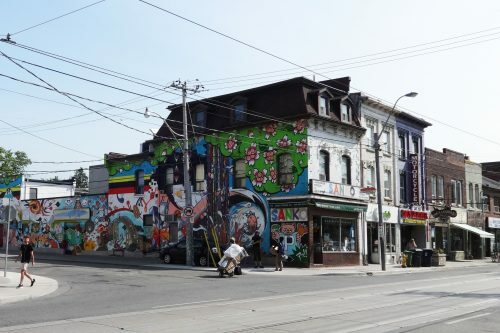 The City of Toronto’s City Planning Division initiated the West Queen West HCD Study in Spring 2016, engaging a consultant team led by EVOQ Architecture (formerly FGMDA) to conduct the study. The Study phase concluded in June 2017 with the recommendation to proceed to the Plan phase for a potential West Queen West HCD (Bathurst to Dufferin) and Parkdale Main Street HCD (Dufferin to MacDonnell/Jameson). The purpose of the HCD Plan phase is to develop policies and guidelines to conserve the cultural heritage value and heritage attributes of the two areas. The process includes two public meetings, as well as the convening of a community advisory group to provide specific and detailed feedback on policy directions and recommendations.